“I Learned to Live a Different Way"
Matt Taylor knows from experience the importance of having peer support at the time of a traumatic injury. In 2011, he acquired a spinal cord injury, leaving him paralyzed from the chest down, and with limited movement in his hands and triceps. At the time of the accident, he said the doctors told him to "find a good nursing home." He was 23. "They didn't tell me anything about in-home care, or about receiving services other than in a nursing home. I find this to be a common response within hospital settings." What Taylor learned, however, is that more options are available. One of these options is Transitional Paths to Independent Living (TRPIL), an organization that promotes independent living and advocates for the civil rights of people with disabilities. TRPIL provided Taylor with supports that enable him to live independently, like hiring a family member to assist with things he can't physically do himself. 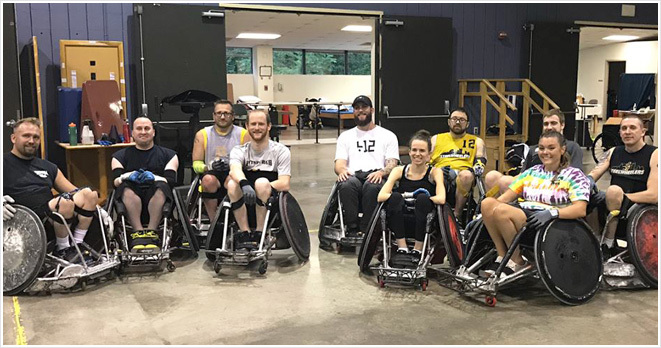 Interestingly, Taylor also received considerable help from a wheelchair rugby team. "I was sent to HealthSouth Rehabilitation after the accident, and that is where the team practices. One Sunday one of the players came to my room and said, 'You should check out rugby.'" Taylor was hesitant because he had been told he wouldn't be able to do anything like that – but when he saw guys who had the same disabilities as he did having a good time, playing a sport he thought he would like to play, he said, "It was eye-opening to see what was still possible after acquiring the disability that I did." Transitional Paths to Independent Living (TRPIL) was previously known as Tri-County Patriots for Independent Living (TRIPIL), providing services in Washington, Fayette, and Greene Counties. However, the program became so successful that it has expanded its work throughout Southwestern Pennsylvania, including the city of Pittsburgh. It offers a wide range of services that assist people with disabilities in leading independent and productive lives. Last year, TRPIL served 1,680 people in Southwestern Pennsylvania. He said all but two of the rugby players have spinal cord injuries, "So there's nothing I’m going through that they haven't seen. The things they’ve taught me are definitely a big factor in my independence and well-being. I learned to live a different way . . . and I've probably done more after my accident than I did before." Two of Taylor's teammates worked at TRPIL, and he was able to get a job with the organization. He's held a few positions there, and today is its membership director. He also visits various rehabilitation facilities where he educates staff and patients about in-home care, "because I have a feeling they're being told the same thing I was. I want them to know about options other than nursing home care, such as in-home attendant services, and about activities available like sports, peer support groups, independent living center services, or driving a car again." Taylor points out that each disability requires different support. "I can't do peer support for someone with cerebral palsy or muscular dystrophy because I don't know everything that comes along with those disabilities. The biggest thing is to get around people who have the same disabilities and see what's possible, especially with acquired disabilities. It's about learning a whole new lifestyle – with the help of a lot of people."